‘C++ Traits’ is an idiom that allows a great level of abstraction, normally possible only by a combination of inheritance and composition, all at compile time. It allows a class to use any object by relying on its traits, i.e., functions and member variables exposed by that object. What C++ Traits are not? There is no magic here, only metaprogramming using templates. The compiler doesn’t have any functionality to automatically find out properties of an object and automatically link to the corresponding algorithm. The programmer (still) needs to do that. Traits are an idiom or a way by which you can implement it all so it happens at compile time. Traits are nothing but a bunch of classes that have static public member variables to store information about a different class (O), needed to make a decision by the consumer of the object of that different class O. Since traits class store static public member variables, they are often implemented as structs. When a variant of O is written by a programmer, the onus of listing its traits lies on the programmer. Thus traits class is written as a templated struct that takes the object type, but doesn’t actually use it. The programmer then writes a specialization of this templated struct and lists all the member variables again into it, changing whichever ones are required to specify the new behaviour. 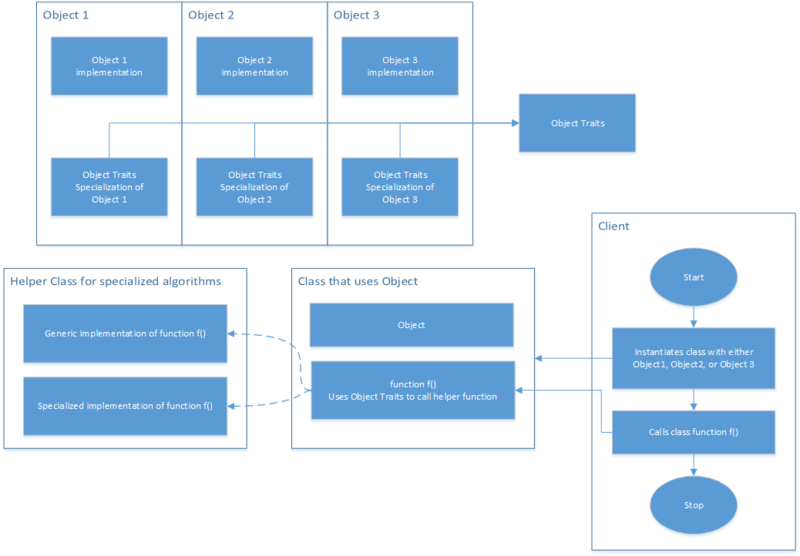 An algorithm needs to make decisions based on the object properties, so all information about the properties is stored in the traits class. A templated public function/class C is created that takes the object type, then internally calls yet another templated helper function which takes the object type plus all the required traits as well. This helper function contains the actual code or implementation of the algorithm. Specialized versions of the helper functions are implemented for each trait that affects the algorithm. The client remains oblivious to the traits class. It passes the object of type O to the templated public function/class C, then calls whatever functions it wants to call on it. C, in turn, has code to check the traits of O and call appropriate helper function. This call to helper function is required because a class template cannot have specialized function unless the class itself is specialized. Above diagram summarizes the C++ implementation. Now let’s try our hands on some sample code. We will try to implement a Binary Search Tree which can use different types of Nodes. As we know, we can either calculate the depth of a tree every time we need it, or store it in the node itself. Similarly, a node can also point to its parent, or not. For simplicity, let’s implement only the first functionality. The default is false, but it could very well be true. Remember that specializations will be opposite of default. NOTE: You can also chose to ignore specifying the default and simply go ahead and write specializations for all (supported) cases. Now lets define a default node. Since its trait (isStoringDepth) matches with the default value (false), we don’t need to write a specialization for it. Now we will define a node that internally stores depth. Since it is a departure from the default, we will have to write specialized traits as well. The behaviour of Add() function depends on whether we want to store depth or not. If the node doesn’t store depth, Add() will only add a new node. If node does store depth though, Add() will need to update the depth field of all the parent nodes leading up to the newly inserted one. For this reason, we have templated the Add() function. Note that the template takes a trait, not a Node. This allows us to write new Node classes without changing the BST class itself, and this is where the need of traits idiom is fully justified. NOTE: The helper functions are implemented inside a templated class BSTHelper. This is just to keep the global namespace clean. Tomorrow the client can implement a new node class, define its traits and BST code wouldn’t need to change even though it is all linked together at compile time. No need for virtual tables and no need to create pointers.